Photo from Rachael Ray Magazine We've been studying Greek and Roman mythology, Sailor and I. She's quite smitten with the ancient world, thanks to this series. This week, we read about Perseus and his bold quest for the head of Medusa. The maidens that guard the golden apples tell Perseus where to find the snake headed beast, but first they sing him a song about golden apples. Their poem compares the apple tree to the passage of time and to the joys and sorrows of life. We wait to welcome the good and true. We wait for the dawn of a glad new year. But hope shall abide to comfort us all. Till every joy to the winds shall be flung. For its boughs shall be laden with apples of gold. What was true in the ancient world is true in the moden world. Readers, I hope that your joys are many and your sorrows are few, but either way, here are some delicious caramel apples to entrance the heart and enliven the palate. May all of your boughs be laden with apples of gold. Notes: Be sure to use a big pot, since the syrup foams up at first. Green apples are just as yummy as the red, so use a combo, if you like. Line a baking sheet with parchment. Skewer each apple stem with a lollipop stick or thick bamboo skewer. Fill a large bowl one-quarter of the way with ice water. Wipe the chilled apples dry. 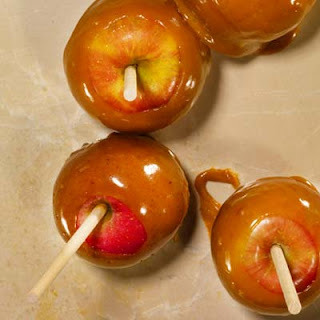 Working with 1 at a time, hold the apple by the stick and dip into the caramel, tilting the saucepan and twirling the apple to coat all but a 1-inch border around the stem. Place the caramel apples on the prepared baking sheet and refrigerate for 20 minutes before serving. The apples look delicious and I love the poem. We can't wait to see your family tommorow. Oh Aunt Erin! Those Apples look wonderful. If only I could bust those out and make them in my dorm. Just a great fall treat. I hate to say it, but I don't think you could do the caramel apples without the cream. You can make a caramel for dipping without it, but I don't think you'll get the right consistency for clinging to the apple unless you use something made in a factory or by a cow. Sugar does funny things at high temps, so I don't have too much confidence. PS Kimball will make a great Percy! Thanks for your helpful but disappointing advice:). Maybe we can make and consume them while Henry's away at cub scouts and clean up the evidence before he gets home? Caramel apples are some of my favorite fall treats, although that list is quite long. Wonder how a pear would work in this? Have a ton on our trees that need using. Do you remember when we made those caramel apples for German lesson? Miss you! It was great seeing you this summer. Oregon sounds great!